For a limited time receive a FREE Lake Country White 6.5" Flat Pad with your purchase of this kit! A retail value of $12.99. 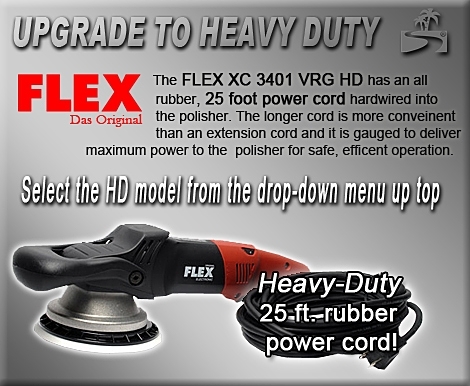 The FLEX XC3401 VRG Dual Action 6.5 Inch Pad Kit gives you all the tools you need for complete paint correction, polishing, and protection. You will receive an assortment of foam pads of your choosing, plus bonnets, microfiber towels, and pad care products. All this is priced at a significant savings over buying these items separately. Use this FLEX kit with your favorite polishes and waxes to bring back the shine on your vehicle. This kit includes Lake Country CCS Foam Pads. Choose any five pads from the menus at the bottom of the page. Prevention of dry buffing is as easy as misting an unused pad with McKee's 37 Polishing Pad Conditioner. It only takes a couple of spritzes to prep the pad for polishing. The rich lubricants instantly penetrate the pad, softening and conditioning the material. Even if the pad has never been used, it will glide across the paint like you�re halfway through the detail session. Orange Light Cutting Foam 6.5"- Firm, high density foam for scratch and defect removal. Use this pad with polishes and swirl removers. It�s an all around pad that will work on most light to moderate imperfections. Green Polishing/Finishing Foam 6.5"�- Use this foam to apply one-step cleaner waxes. It is a balance of polishing and finishing that is perfect for all-in-one product application. Gray Finishing Foam 6.5"�- Composition is firm enough to withstand added pressure during final finishing to remove buffer swirls. It has no cut and will apply thin, even coats of waxes, sealants, and glazes. Blue Finessing Foam 6.5� �� This blue foam pad has soft composition for applying glaze, finishing polish, sealants, and liquid waxes. The soft pad has no cut, making it perfect for applying nonabrasive products evenly. CCS Red Ultrasoft Wax/Sealant Foam 6.5"�- This soft, imported foam is ideal for applying the final coat of wax or sealant. The foam works especially well when applying liquid waxes or sealants because it is firm enough to keep the majority of the product on the paint, rather than soaking it up. The red foam has no cut or cleaning ability. CCS Super Soft Gold Jewelling Foam Pad 6.5"�- The CCS Super Soft Gold Jewelling Pad is made of Lake Country's softest foam. Use the gold pad to apply a very fine polish or glaze as the final step of the polishing process. Jewelling is the term coined for this step because it intensifies gloss and reflectivity, like a jewel. The gold foam pad also works well for wax and sealant application. 5 CCS 6.5 inch pads of your choice! A total retail value of $526.88.�Save $71.88!